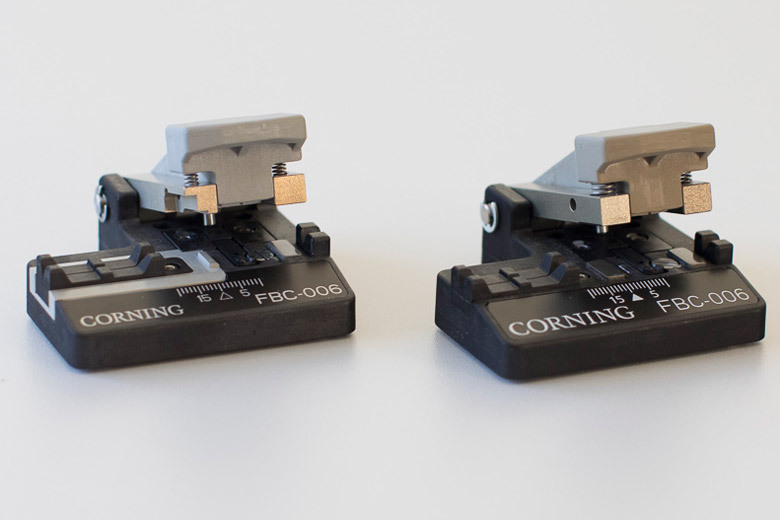 As an OEM partner for Corning, WALO – TL manufactures and sells the FBC-005, FBC-006 and FBC-012 cleaver off-the-shelf to telecommunications customers all over the EMEA area. Besides, customers may have this cleaver model modified to their specific needs by WALO – TL. Contact us for customized manufacturing offers. The FBC-006 cleaver for example is the first choice for optical-fiber installers. Based on its unsurpassed quality in cleaving precision, its break angle, the high quality of the fiber ends, its stable cleaving operation and simple maintenance, The exchangeable inlays and fiber guides of the FBC-006 allow a wide range of use for all optical fibers with a cladding diameter from 80 µm to 140 µm. This Corning FBC-005 high precision fiber cleaver provides laboratory-quality performance in a field cleaver. Fibers cleaved with the simple craft-friendly unit allow for end-angles of less than 0.5º from perpendicular. Simple and fast to operate, the precision diamond blade accommodates single-mode and multimode fibers up to 900 μm coating. Benefit from the two-position adjustable cleaving tension. This unit is RoHS compliant. 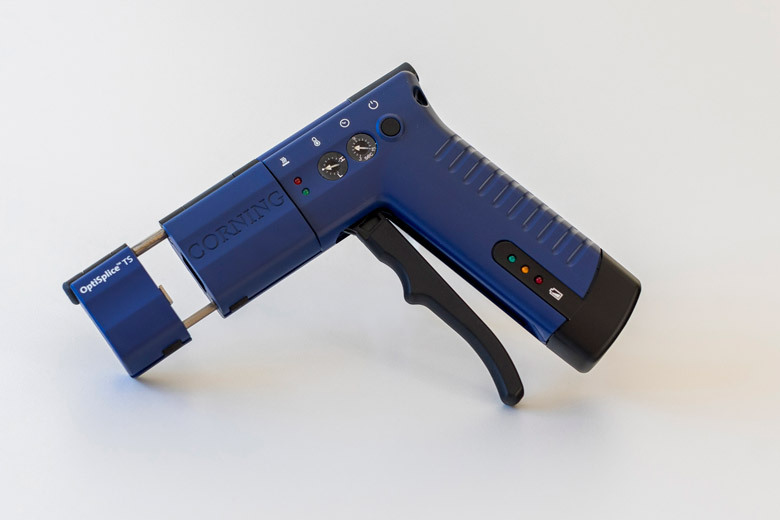 The Corning FBC-006 fiber cleaver with a diamond blade provides smooth, flat, perpendicular fiber end faces (typically < .35º) necessary for low-loss fusion or mechanical splicing. Fast and easy to use, it produces high-quality, repeatable cleaves for multimode, single-mode, ClearCurve® and NZDS fibers in one simple step. This unit is RoHS compliant and will cleave 250 μm coated fibers and 900 μm buffered fibers with a cladding diameter of 80 μm to 140 μm. 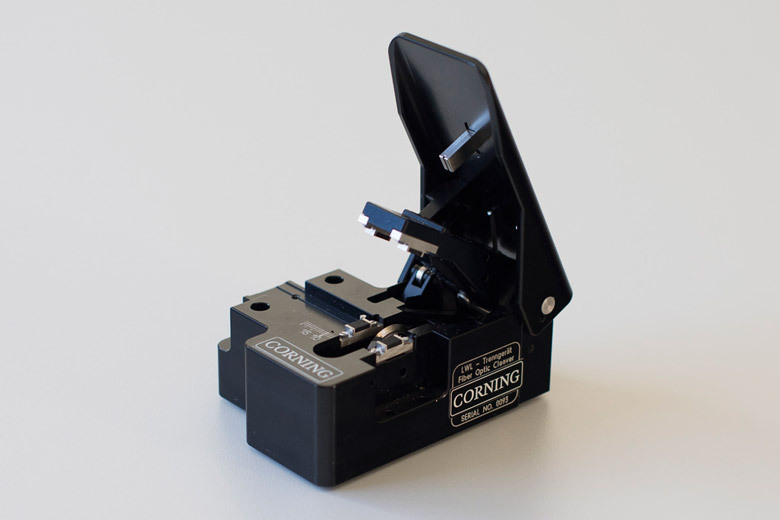 The Corning FBC-012 mass fiber cleaver provides excellent cleaves of one to 12 fibers using a simple one-step operation. The cleaver comes with a universal single-fiber guide that may be used when cleaving single fibers. 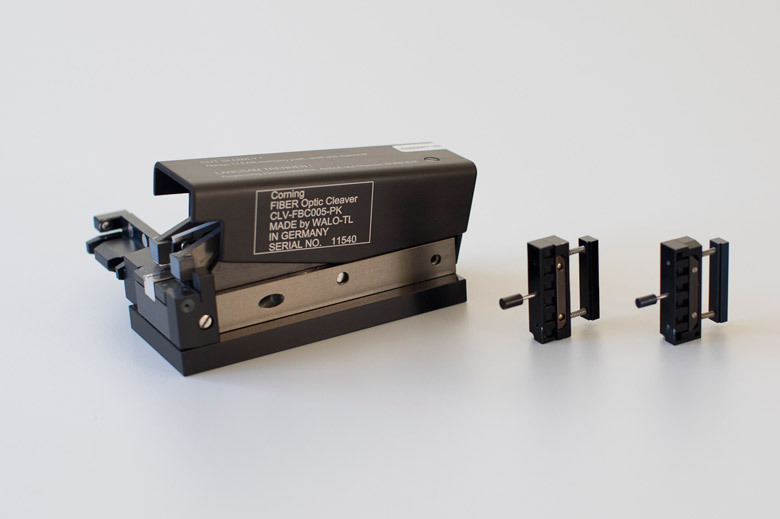 The removable guide allows the cleaver to hold common fiber handling adapters of mass fusion splicers or fiber handlers for UniCam Connector installation. The 12-position blade can be replaced in the field. This unit is RoHS compliant. As an OEM partner for Corning Cable Systems, WALO – TL manufactures the OptiSpliceTM stripper in serial production. Customers in the telecommunications and optical fiber industries use the OptiSpliceTMTS to remove the coating of optical-fiber cables. The device is suitable for all optical fibers specified for the OptiSpliceTM Ribbon and OptiSpliceTM one splicers: Single-mode, multimode and NZDS fibers, glass diameters 125 μm with coating diameter 250 μm (single fibers up to 900 μm), single fibers or fiber ribbons (2-, 4-, 6-, 8- und 12-fiber ribbons).